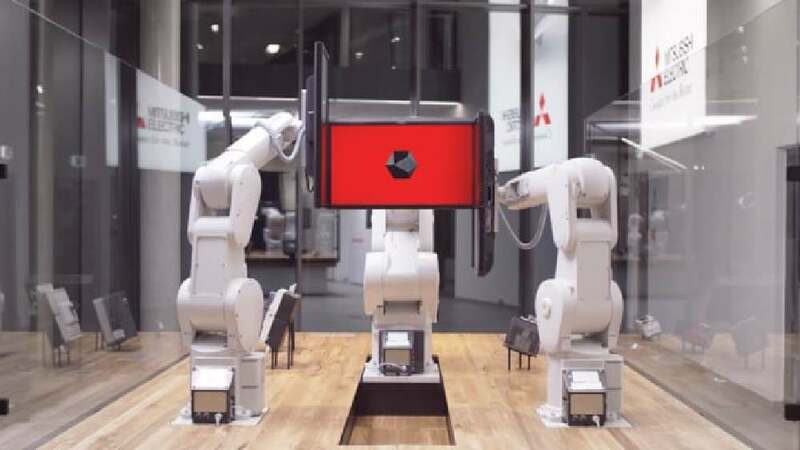 The THREEBOTS exhibit, consisting of three industrial robots, is the highlight and epitome of a brand exhibition organised by Mitsubishi Electric in its new German branch in Ratingen. ­Modern, aesthetically appealing and easy-to-understand thanks to accompanying multimedia stations, the exhibition highlights the entire product spectrum of the Japanese technology company. The robot exhibit takes centre stage as it captures all disciplines involved in factory automation, with 90 per cent of components used for it being manufactured in-house by the company, including displays, servomotors, controllers and the robots themselves. THREEBOTS fascinates with the robots’ ability for swift harmonious movements and their almost organic appearance. In the interactive mode, the robots can give information to visitors about the prod­ucts on the display table. Each equipped with a huge monitor, the three robots thus ­convey a sense of the latest advances in technology – in the form of a highly fascinating ­installation. What is particularly outstanding about this installation is the high standard and simplicity with which it simultaneously combines the technological advances of Mitsubishi Electric’s ­products for promotional purposes. The almost humoristic choreography was implemented in a highly elegant and appealing way, making it bridge the gap between human and machine to self-sufficient and playful effect.